NOTE: Before purchasing, check with your instructor to ensure you select the correct ISBN. Several versions of Mastering ™ A&P exist for each title, and registrations are not transferable. To register for and use Pearson's MyLab & Mastering products, you may also need a Course ID, which your instructor will provide. If purchasing or renting from companies other than Pearson, the access codes for Mastering A&P may not be included, may be incorrect, or may be previously redeemed. Check with the seller before completing your purchase. Mastering™ A&P is an online homework, tutorial, and assessment product designed to engage students and improve results by helping students stay on track in the course and quickly master challenging A&P concepts. 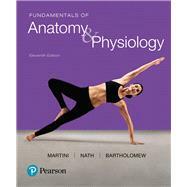 Features in the text are supported by Mastering A&P assignments, including new SmartArt Videos, Interactive Physiology 2.0, Dynamic Study Modules, Learning Catalytics, Spotlight Figure Coaching Activities, lab study tools, Get Ready for A&P, plus a variety of Art Labeling Questions, Clinical Application Questions, and more. Dr. Martini received his Ph.D. from Cornell University in comparative and functional anatomy for work on the pathophysiology of stress. In addition to professional publications that include journal articles and contributed chapters, technical reports, and magazine articles, he is the lead author of 10 undergraduate texts on anatomy and physiology or anatomy. Dr. Martini is currently affiliated with the University of Hawaii at Manoa and has a long-standing bond with the Shoals Marine Laboratory, a joint venture between Cornell University and the University of New Hampshire. He has been active in the Human Anatomy and Physiology Society (HAPS) for over 24 years and was a member of the committee that established the course curriculum guidelines for A&P. He is now a President Emeritus of HAPS after serving as President-Elect, President, and Past-President over 2005–2007. Dr. Martini is also a member of the American Physiological Society, the American Association of Anatomists, the Society for Integrative and Comparative Biology, the Australia/New Zealand Association of Clinical Anatomists, the Hawaii Academy of Science, the American Association for the Advancement of Science, and the International Society of Vertebrate Morphologists. Edwin F. Bartholomew received his undergraduate degree from Bowling Green State University in Ohio and his M.S. from the University of Hawaii. Mr. Bartholomew has taught human anatomy and physiology at both the secondary and undergraduate levels. In addition, he has taught a range of other science courses (from botany to zoology) at Maui Community College (now the University of Hawaii Maui College). For many years, he taught at historic Lahainaluna High School (LHS), the oldest high school west of the Rockies, where he assisted in establishing an LHS Health Occupations Students of America (HOSA) chapter. He is a coauthor of Fundamentals of Anatomy & Physiology, Visual Anatomy & Physiology, Essentials of Anatomy & Physiology, Visual Essentials of Anatomy & Physiology, Structure and Function of the Human Body, and The Human Body in Health and Disease (all published by Pearson). Mr. Bartholomew is a member of the Human Anatomy and Physiology Society (HAPS), the National Association of Biology Teachers, the National Science Teachers Association, and the American Association for the Advancement of Science. Dr. Judi Nath is a biology professor and the writer-in-residence at Lourdes University, where she teaches at both the undergraduate and graduate levels. Primary courses include anatomy, physiology, pathophysiology, medical terminology, and science writing. She received her bachelor’s and master’s degrees from Bowling Green State University, which included study abroad at the University of Salzburg in Austria. Her doctoral work focused on autoimmunity, and she completed her Ph.D. from the University of Toledo. Dr. Nath is devoted to her students and strives to convey the intricacies of science in captivating ways that are meaningful, interactive, and exciting. She has won the Faculty Excellence Award—an accolade recognizing effective teaching, scholarship, and community service—multiple times and in 2013 was named as an Ohio Memorable Educator. She is active in many professional organizations, notably the Human Anatomy and Physiology Society (HAPS), where she has served several terms on the board of directors. Dr. Nath is a coauthor of Visual Anatomy & Physiology, Visual Essentials of Anatomy & Physiology, Anatomy & Physiology, and Human Anatomy (published by Pearson), and she is the sole author of Using Medical Terminology and Stedman’s Medical Terminology (published by Wolters Kluwer). Her favorite charities are those that have significantly affected her life, including the local Humane Society, the Cystic Fibrosis Foundation, and the ALS Association. In 2015, she and her husband established the Nath Science Scholarship at Lourdes University to assist students pursuing science-based careers. When not working, days are filled with family life, bicycling, and hanging with the dogs. Dr. Ober received his undergraduate degree from Washington and Lee University and his M.D. from the University of Virginia. He also studied in the Department of Art as Applied to Medicine at Johns Hopkins University. After graduation, Dr. Ober completed a residency in Family Practice and later was on the faculty at the University of Virginia in the Department of Family Medicine and in the Department of Sports Medicine. He also served as Chief of Medicine of Martha Jefferson Hospital in Charlottesville, Virginia. He is currently a Visiting Professor of Biology at Washington and Lee University, where he has taught several courses and led student trips to the Galapagos Islands. He was on the Core Faculty at Shoals Marine Laboratory for 24 years, where he taught Biological Illustration every summer. Dr. Ober has collaborated with Dr. Martini on all of his textbooks in every edition. Claire E. Ober, R.N., B.A., practiced family, pediatric, and obstetric nursing before turning to medical illustration as a full-time career. She returned to school at Mary Baldwin College, where she received her degree with distinction in studio art. Following a 5-year apprenticeship, she has worked as Dr. Ober’s partner in Medical & Scientific Illustration since 1986. She was on the Core Faculty at Shoals Marine Laboratory and co-taught the Biological Illustration course with Dr. Ober for 24 years. The textbooks illustrated by Medical & Scientific Illustration have won numerous design and illustration awards. Dr. Boudrie studied at Brown University in Providence, Rhode Island, for her B.S. in biology, and also obtained her M.D. there. After graduation she served in the National Health Service Corps, a program of the U.S. Public Health Service, which sponsored her last 2 years of medical school. She was assigned to provide health education to the rural communities of southeast Michigan with a special focus on seniors. She has had the great pleasure of working with a variety of undergraduate and graduate students in the Northeast and Midwest, earning teaching excellence awards and a nomination for Carnegie Foundation’s U.S. Professor of the Year in 2014. Currently, she chairs the Department of Biology and Health Sciences at Lourdes University, a small Franciscan liberal arts school in northwest Ohio. Dr. B’s passion is the vital engagement of her students in the study of anatomy, physiology, and pathophysiology. She often brings in references to her love of the arts, of cooking, and of reading across the disciplines. Her family fosters stray dogs and cats, and maintains an organic home garden and orchard in the country. Dr. O’Keefe did her undergraduate studies at Marquette University, attended graduate school at the University of Wisconsin, and received her M.D. from George Washington University. She was the first woman to study orthopedics at The Ohio State University during her residency. She did fellowship training in trauma surgery at Loma Linda University in California. In addition to her private orthopedic practice, she has done orthopedic surgery around the world, taking her own surgical teams to places such as the Dominican Republic, Honduras, Peru, New Zealand, and Burkina Faso. She serves on the board of Global Health Partnerships, a group that partners with a clinic serving 35,000 people in remote Kenya. Dr. O’Keefe has always enjoyed teaching and now supervises medical students from the University of New Mexico doing ongoing research in Kenya. She lives in Albuquerque with her Sweet Ed. She is mother of four, grandmother of nine, and foster mother to many. Dr. Petti is a professor at San Diego Miramar College, and teaches courses in human anatomy and physiology, human dissection, and health education. He is President Emeritus of the Human Anatomy and Physiology Society (HAPS) and holds a doctorate from the University of San Diego. As a dual U.S./Italian citizen, he also teaches courses in Italy that focus on the genesis of anatomy as a science and its influence on the Renaissance masters, a story unique to the Italian peninsula. His students range from anatomy professors pursuing continuing education to undergraduates in study abroad programs. Dr. Petti is often invited to speak about the connection between art and anatomy in medieval and Renaissance Italy at museums, conferences, and universities. The Italian government has invited him to speak at their Cultural Institutes in Los Angeles and New York City, and the University of Palermo in Sicily included him in a seminar series celebrating its 210th anniversary.